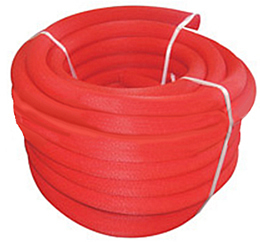 This double jacket Fire Hose is constructed of high tensile strength polyester yarns, lined with a high-tech EPDM tube. Its engineered design guarantees minimum weight with maximum durability and flexibility. Manufactured in accordance with National Fire Protection Association (NFPA) 1961 standard, latest edition, within our ISO-9001:2015 certified quality assurance system. The polyester construction is mildew & rot-proof, outstanding abrasion resistance with our innovative wisentecTM coating, tough, dependable and light weight. Double jacket, polyester spun as warp and filament polyester as weft/filler, EPDM liner. Municipal fire brigades, industrial fire brigades. White, red, yellow, green, blue, other colors on request. Brass/Aluminum NST/NPSH expansion ring threaded coupling, other type on request. 50′(15m), 100′(30m), other length on your request. -40°F to 158°F(-40°C to 70°C), other temperature on request. A single jacket, polyester Fire Hose lined with a high-tech EPDM tube. Designed for fire brigade or exterior fire protection. Single jacket, polyester spun as warp and filament polyester as weft/filler, EPDM liner. This type of durable Fire Hose is Nitrite rubber covered hose, and along with high tensile strength polyester reinforcement for maximum durability and flexibility. Ribbed Nitrite rubber cover greatly increases abrasion resistance and provides long service life. Smooth Nitrite rubber liner minimum pressure drop. Hose remains flexible to temperatures as low as -4°F (-20°C) and is resistant to ozone, oxidation, and most chemicals or petroleum products. Polyester and/or Nylon reinforcement, tightly woven, twill weave resists puncture. Nitrite rubber cover and liner. Polyester and/or Nylon reinforcement. 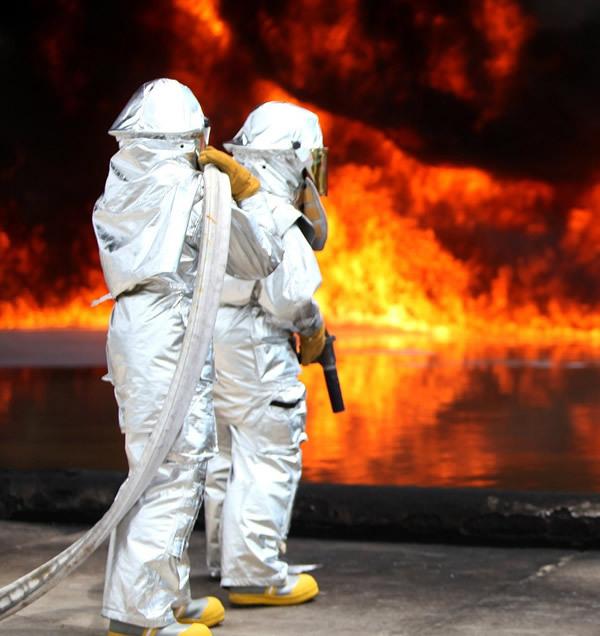 Municipal fire fighting, industrial fire fighting, In-Plant fire protection. Meet and exceed UL 19 standard and BS6391 standard. Yellow, red, other colors on request. -4°F to 175°F(-20°C to 80°C), other temperature on request. 100% circular woven synthetic twill weave, ribbed nitrite cover, ultra smooth nitrile rubber Iiner. Permanently bonded to all warp and filler. Tough and Durable-Special rubber compound provides a tough cover that resists heat and abrasion, snags, hot embers, cuts, most petrochemicals and cold environments. Ease of Handling-Unique construction provides a very flexible,kink resistant, maneuverable hose which packs tightly in hose bed. Low Friction loss – The ultra-smooth lining and resilient expansion qualies provide maximum flow with minimum friction loss. Meets and exceeds all NFPA Standards 1961，current edition. Municipal and rural large diameter water supply, relay pumping crash/fire rescue, master stream appliances, industrial construction，military uses, water and ice rescue. Red，yellow, orange, other colors on request. 100′(30m), other length on your request. -4°F to 158°F (-20°C to 70°C), other temperature on request. 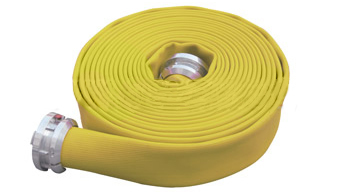 This Fire Hose is made from thermoplastic polyether based polyurthane (TPU) covered and EPDM lined by high pressure around a circular woven jacket. With high adhesion strength and top fatigue resistance performance. Extreme abrasion resistance capability on the outer surface make the hose adapt to more working condition. Outstanding diameter stability with high restored rate after be pressured then depressured. Lager volume transfer capability of liquid. Lighter, softer for being deployed. Maximum recommended working pressure: 50% of the listed values of burst pressure for temporary use. To obtain maximum lifetime of the hose, it is recommended that the working pressure or the working tensile stress do not exceed 1/3 of the listed values. 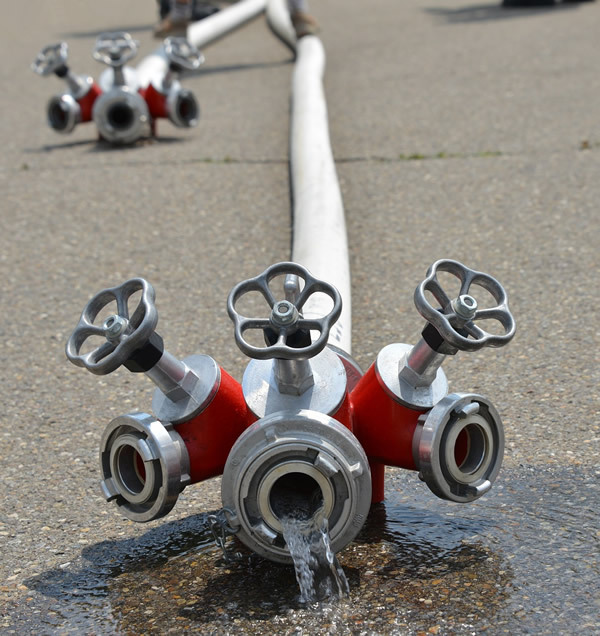 Municipal Supply Line; for supply line, continuously transfer; water from fire hydrants to fire trucks. Red or yellow, other colors on request. Storz, other couplings on request. 100’(30m), other length on request. -49°F to 175°F (-45℃ to 80℃), other temperature on request. A double polyester and/or Nylon jacket lined with EPDM or Thermoplastic Polyurethane (TPU) tube. This Fire Hose is manufactured in accordance with NFPA standard 1961, latest edition within our ISO-9001: 2008 certified quality assurance system. Reverse twill weave of the inner jacket provides a smooth waterway and superior lining adhesion. 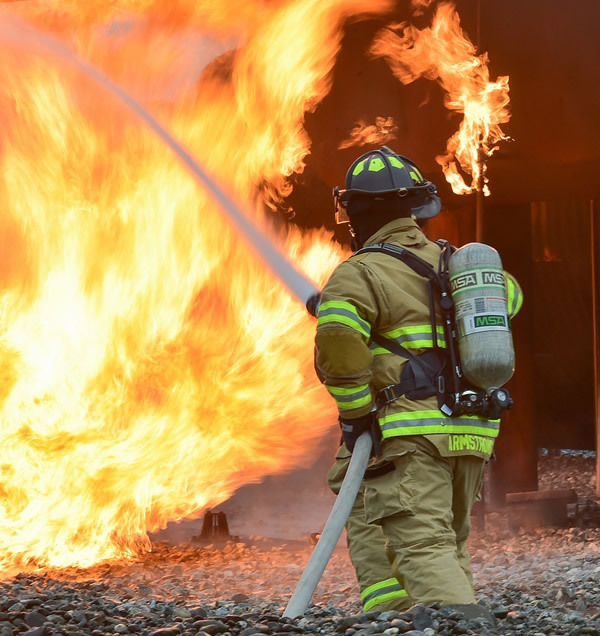 Specifically engineered for attack, supply and relay operations – a truly universal fire hose. Double jacket, polyester and/or Nylon jacker, EPDM or Thermoplastic Polyurethane (TPU) liner tube. Municipal and rural large diameter water supply, relay pumping crash/fire rescue, master stream appliances, industrial fire fighting，potable watertransfer, frequently used for soft suction in shorter lengths. Red, yellow, orange, other colors on request. Storz or extruded aluminum threaded coupings. 50′(15m), 75’(23m), 100′(30m), other length on your request. Forestry Fire Hose-HBX Series is a small diameter lightweight, compact single jacket. The optional WisentecTM treatment greatly increases abrasion, heat, and flame resistance while virtually eliminating water pick-up. With 50’of forestry fire hose weighing only 1.25 1bs and a coil diameter of around 9 inches, this hose can be taken almost anywhere. A stripe of a contrasting color running the full length of the hose can be woven into the jacket. High tenacity filament polyester as warp and weft, thermoplastic polyurethane (TPU) liner. Light duty fire hose, supply sprinklers, remote fireline protection. White, yellow, other colors on request. Brass GHT threaded ends, other fittings on request. Forestry Fire Hose is a lightweight single jacket 100% filament polyester hose lined with thermoplastic polyurethane (TPU) elastomer. The optional WisentecTM treatment greatly increases abrasion, heat, and flame resistance while virtually eliminating water pick-up. HBS forestry fire hose meets the new”Type ll”specification, is protected from mildew and no drying is required. Its PU tube provides much better resistance to punctures, mildew,petroleum, solvents, and aging as compared to conventional rubber fire hose, light and compact. High tenacity filament polyester as warp and weft/filler, thermoplastic polyurethane (TPU) liner. Aluminum NST/NPSH expansion ring threaded coupling or quarter turn, other fittings on request. The jacket shall be evenly and firmly woven and free from visible defects, thread knots, lumps and irregularities of twist. The warp and filler will be high strength,low elongation polyester yarns. The jacket is matched to assure a precision fit to meet precise hydrostatic test requirements. Jacket is plain or twill woven. It is highly resistant to ozone, abrasion and lightweight, outstanding low temperature performance, excellent mechanical properties, high transparency, as well as good oil and grease resistance. Single jacket, 100% high tensile strength virgin polyester yarns;Smooth TPU lining ensures the minimum friction for maximum flow. The Semi-rigid Hose-STS can be used for fire vehicles, fire hydrants,hose reels, construction pumps, pumps for transportation of water or other extinguishing agent. White, blue, other color on request. Storz Couplings & BS instantaneous couplings & Italian couplings or other type on your request. The Semi-rigid Hose-STS is manufactured conforming to EN694 standard. 75′(23m)，100′(30m)，130′(40m), other length on your request. The warp and filler will be high strength, low elongation polyester yarns. The jacket is matched to assure a precision fit to meet precise hydrostatic test requirements. Jacket is plain or twill woven. Single jacket, 100% high tensile strength virgin polyester yarns; smooth PVC lining ensures the minimum friction for maximum flow. The Semi-rigid Fire Hose - SPS can be used for fire vehicles, fire hydrants,hose reels, construction pumps, pumps for transportation of water or other extinguishing agent. White, red, other color on request. The Semi-rigid Hose-SPS is manufactured within our ISO-9001:2000 certified quality assurance system. 75′(23m), 100′(30m), 130′(40m), other length on your request. 14°F to 131°F(-10°C to 55°C), other temperature on request. The jacket shall be evenly and firmly woven and free from visible defects, thread knots, lumps and irregularities of twist. The warp and filler will be high strength, low elongation polyester yarns. It is highly resistant to most chemicals, petrol products, ozone & UV exposure, hydrolysis, and rot & mildew. Single jacket, 100% high tensile strength virgin polyester yarns; Smooth EPDM lining ensures the minimum friction for maximum flow. The Semi-rigid Fire Hose - SES can be used for fire vehicles, fire hydrants,hose reels, construction pumps, pumps for transportation of water or other extinguishing agent. White, other color on request. The Semi-rigid Hose-SES is manufactured within our ISO-9001:2000 certified quality assurance system. The Rack Hose - RAS is an all polyester single jacket interior protection hose with EPDM inner liner, for buildings and plants. Low friction loss for maximum flow. Strong, compact and practical,and will fit on most hose storage device. Polyester spun as warp and filament polyester as weft, EPDM liner. Interior fire fighting, fire cabinet, pin racks. Brass NST/NPSH expansion ring threaded coupling, other fittings on request. 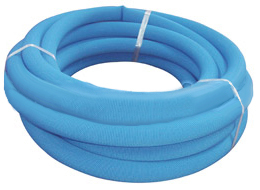 The Rack Hose-RBS is an all polyester single jacket interior protection hose with Thermoplastic Polyurethane (TPU) liner for buildings and plants. 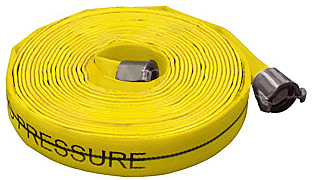 The hose of light weight and compact, approximately half the weight of standard rubber lined single jacket hose. Low friction loss for maximum flow. Strong, compact and practical, and will fit on most hose storage device. Our liner process produces an amazingly thin but smooth inner waterway, tough and ready for action but light in weight. Polyester spun as warp and filament polyester as weft. A single jacket 100% filament polyester hose intended for interior protection and occupant use in buildings and plants. Rack Hose-RBX is lined with thermoplastic polyurethane (TPU). Lightweight and compact. RBX rack hose has a service test pressure rating of 150 Psig(1035kpa) and 250 Psig (1750 kpa) and is approximately half the weight of conventional rubber lined single jacket hose. Filament polyester as warp and weft, thermoplastic polyurethane (TPU) liner. Interior fire fighting, fire cabinet , pin racks. White, yellow, other colors on request. White, other color on request. 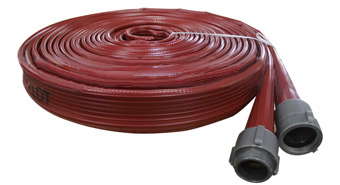 High quality lay flat Fire Hose for all fire-fighting operations. Circular woven jacket out of 100% high tenacity synthetic yarn with an inner liner made out of a vulcanized high quality EPDM-compound. It is highly resistant to most chemicals, petrol products, ozone & U.V. exposure, hydrolysis, and rot & mildew. The liner process produces an amazingly thin but smooth inner waterway, yielding an extremely low friction loss for maximum flow. Single jacket, 100% high tensile strength virgin polyester filament yarns, both warp and filler; High grade EPDM as inner lining, cold flexible, suitable also for hot water, excellent resistance to sea water, UV and ozone. Municipal fire brigades, military, marine fire fighting, commercial and civil engineering. Storz couplings or other type on request. -58°F to 158°F(-50°C to 70°C), other temperature on request. 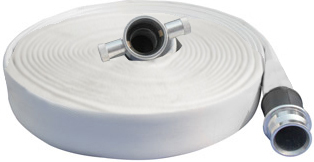 Single jacket fire hose consists of an impermeable elastomeric lining, a synthetic fibre reinforcement and externally applied elastomeric coating to the reinforcement. 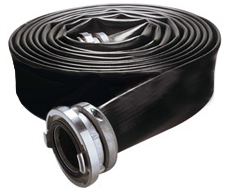 Delivery hoses are non-percolating lay flat type used in fire fighting purpose. Hoses are suitable for use with couplings with the requirements of BS 336:2010 standards. Delivery hose are manufactured to comply BS 6391: 2009 Standards Light weight and flexible. 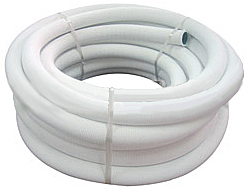 Hose gives good protection against the absorption of liquids and resistance of the reinforcement. Hose belongs to Type 2 with elastomeric lining, synthetic fibre reinforcement and elastomeric coating an the reinforcement. Industrial and rural fire brigades as well as building protection. For general industrial, commercial and civil engineering applications. BS instantenous couplings or other type on request.